I've been painting from the figure for over forty years and only recently I have found an interest in still life as a subject. Still life seemed to provide an opportunity to evade the suggestion of narrative, allowing for concentration on more formal issues. That said, I still, often, discover a protagonist in the compositions. In each of the works selected for this publication there is a toy of shiny plastic, a constant companion in my studio, a watcher and a memento of a time past. 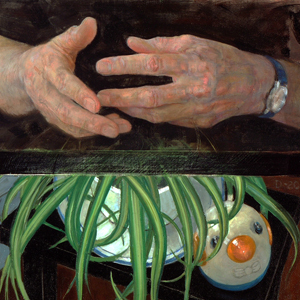 Donohoe, Victoria, Review of Show at Rosenfeld Gallery, Phila. Inquirer, May 13, 2011, Illus. ì86th Grand National Exhibit, American Artists Professional League, New York, New York.